Good morning and welcome to my second post for today, which just happens to be a card, sharing the Peachy Keen Challenge #47. For this challenge, we have this teriffic sketch to follow and a bit of a twist to add. What is the twist you might ask? Well, the twist is to "Think Bling". Not too much of a stretch for me, because I LOVE me some blingage!!! I made this card with the PK-229 Funny Flowers stamp set from Peachy Keen Stamps. The paper is a bargain bin find from my LSS, but there's no info about who makes it. I just thought it was pretty and would make a great spring/summer layout or card, and I think I was right!! ;-) LOL!!! 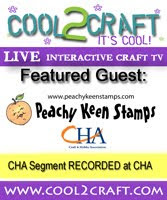 Now for the bling, have you checked out the Peachy Keen Stamps Store lately, because there's a whole lotta bling going on over there. The pearls around the circle are from the store. The actually had a rhinestone in each curve, but I cut those off and will use them for something else. The pearl embellishments on the frog card in the post below are also something new from the PKS Store. This sweet little flower was stamped with Memento Tuxedo Black Ink, and colored with my Copic markers. I finished this card off with a bit of Wild Wasabi ribbon from Stampin' Up!. Oh, how I miss Wild Wasabi! It was one of my favorites!!!! Now it's time to head over to the Peachy Keen Challenge Blog to see what the rest of our awesome designers have in store for you. This week we have the very talented Tiffany Degough designing with us. Please drop by all their blogs and leave them some well deserved love for all their wonderful works of art!!! I sure hope you get the chance to play along with our challenge, because one lucky winner will receive the adorable PK-265 Bunny Dolls stamp set for playing along. It's always so much fun to see what you're doing with your PKS stamps!!!! I'm so glad you could drop by today! I hope you're enjoying a bright and beautiful day, and I hope you have some happy stamping planned! Lorie your card is amazing! Besides your copic skills, the colors you have chosen for your papers are beautiful! I love your card! Lorie, as always, your card is absolutely beautiful. I definitely need a lesson from you using my Copics. Ah, love the colors on this card! Your creation is so pretty. The coloring, colors and papers are awesome together. Love the whole thing. Very cute - love the pearls and the image is adorable. Very pretty card....Love all those pearls you used!! This is so cute. I'm so glad our mutual friend Cheryl directed me to your blog. I love everything you are doing. This has got to be the cutest card I've seen in a while. Everything about it is absolutely darling. The image is so darn cute and colored in so beautifully. Great job with the pearls! WOW! This card is just gorgeous! I love that stamp, along witht he coloring and your ALL the extra details! Those have to be my favorite colors together! Thank You for always inspiring all of us! Lorie I finally gave up figuring how you do it. Your house must be like Willy Wonka's Chocolate Factory..You go in but you never come out!! I just love as always what you did here. The minute the house next to you goes up for sale I am buying it!